The Internet Sacred Texts Archive is committed to the privacy and anonymity of its viewers. This page answers questions about the level of privacy you can expect at our site. Recent events on the web have created an atmosphere of paranoia which can only be dispelled by factual information. Viewers of this site are entitled to full disclosure concerning exactly what information is tracked here, what that information is used for, and who it is shared with. These policies are subject to change. If we change them we will update this page. There is a page for privacy issues specific to purchasing the Sacred Texts CD-ROM at this link. Sacred-texts.com is owned, maintained and funded by J.B. Hare and is not sponsored by, or affiliated with, any religious (or other) organization, corporation or academic institution. What information is collected by this site? This site uses a standard web server provided by our ISP, www.cruzio.com, which monitors your IP address, the page you were referred by, which pages you visit at the site, the time you visited them, and other information about web traffic at this site. The server also logs incorrect URLs sent by browsers, which help us find broken links at the site. This information is made available to sacred-texts in the form of log files, which are deleted after an interval. These log files are not accessible via an http address (i.e., cannot be viewed by third parties). The log files are available for inspection only by the proprietor of this site; in general we only view a digest of the information once a day by an automatic email. The information is used to determine billing by our ISP; find problems with the site; give us an idea of which parts of the site are most heavily viewed so we can improve the site; and to track search engine programs which index the site (robots). What information is provided to third parties? We do not sell or exchange any specific or general information about our viewers with any third party. We do not attach any hidden information to our pages to monitor your page views (cookies). In some cases our pages contain an embedded view of a third party site (frameset) or link to a third party site. These links are labelled [external site]. Some of these sites collect additional information about your page visits or set cookies in your browser, particularly amazon.com. We cannot be responsible for their privacy policies. Some of the pages here have hidden indexing information embedded in them, (META tags) for instance, the main index page. This hidden information can be viewed in your browser by selecting the menu items 'View|Page Source' (Netscape) or 'View|Source' (Internet Explorer). This information is provided so that search engines can categorize pages at this site. It does not allow us or anyone else to track individual browsing behavior. What information is provided to this site by third parties? 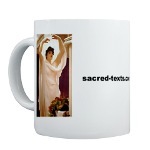 Sacred-texts has a standard affiliate account at Amazon.com, and receives a percentage of sales from click-throughs from this site. Income from the amazon.com affilate program is used to defray costs of this site. Amazon.com provides us with a list of specific books and other items purchased by customers who visited amazon.com through links from our site. Amazon.com does not disclose to us the name of the person who purchased the item or any other personal information about them (e.g. credit cards, home addresses, etc.). The information is used to improve our bookstore and to audit our account at amazon.com. 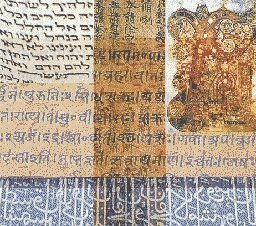 Sacred-texts also has an account with Google AdSense. Ads served by Google are clearly marked 'Sponsored links.' These ads appear on certain top level pages as well as on search pages generated from searches from the 'search' boxes. Google monitors the quantity of click-throughs on ads in order to reimburse sacred-texts, and to bill the linked site. Sacred-texts does not receive any information as to who clicked on these ads, nor how much the linked site was compensated for the click-through. The only information we receive about AdSense click-throughs is the amount of compensation to sacred-texts and the total number of clickthroughs in a given calendar day. Note that we have no control over which ads run on a particular page and that the advertised sites have different privacy policies which we are not responsible for. About information not collected by this site. We can't monitor individuals' browsing history (i.e. how many times a particular viewer comes back to the site); we don't know your email address or actual name (unless you provide this information by sending us email); and rest assured that we can't track what you do with the information provided here or what you think about it.